Offers, short for "loan offers," are proposals from lenders on the whole Liquid platform who wish to lend out their fund for margin traders. When an offer is still live (i.e. not taken by any trader yet), the fund still stay in lender's balance and is not yet deducted. 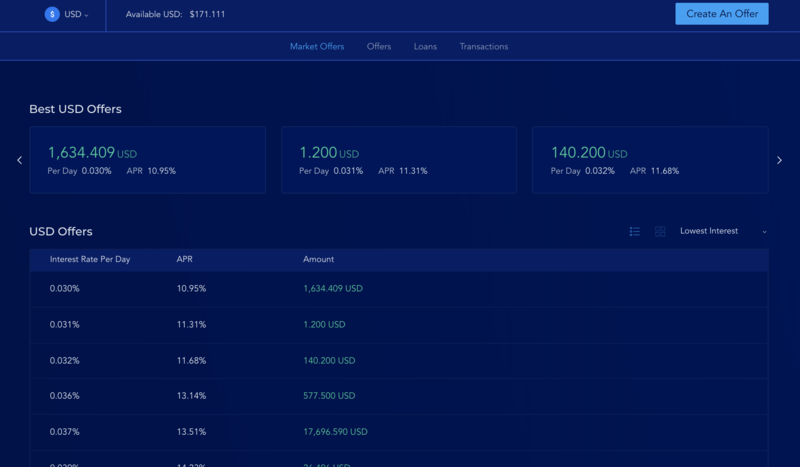 Market Offers tab lists out all loan offers currently available on the platform for a chosen currency. In the screenshot below, we're looking at BTC loan offers. All offers for one currency on Liquid are sorted according to their daily interest rate, from best (lowest rate) to worst (highest rate). Offers will be taken up by traders in this order, from lowest rate to highest rate. For example in the screenshot above, a trader who needs to borrow $2,000 will take up the 1st offer for $1,634.409 at 0.03% daily rate, then the 2nd, 3rd, and 4th offers for respectively $1.2 at 0.031%, $140.2 at 0.032%, and $224.191 at 0.036% daily rate. The remaining of the 4th offer will then become the best offer on the market. This page shows all loan offers created from your Liquid account. Check Auto Re-loan if you want the loan to become a loan offer again once it is paid back to you. Uncheck if you want the loan to simply return to your balance instead (no more loan offer). "Interest Payment Fee" is 50% of Interest Transfer and is collected by Liquid from the lender whenever Interest Transfer is credited. The numbers shown in Gross Amount in screenshot above are rounded up to 3 decimals.